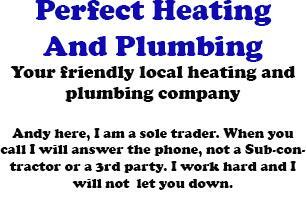 Perfect Heating And Plumbing - Plumber based in Epsom, Surrey. Hello Andy here, I am very proud of my Company - Perfect Heating And Plumbing (PHAP). I am a sole trader so you will deal directly will me and not a sub-contractor. I have been in the trade since leaving school, many years ago. A LOCAL RELIABLE, KNOWLEDGEABLE, DEPENDABLE service with NO call-out charge. 33 years experience. I love the small jobs others companies hate or will not do. I completed a 4 year approved apprenticeship at NESCOT college. After my craft apprenticeship I moved into a design office and continued at college for another 4 years. Passing both the BTEC National and Higher National Certificate in Building Services Engineering (Plumbing). I also passed several City & Guilds Courses in Computer Aided Design. After 8 years designing I wanted to be my own Boss and get my hands dirty again. Since making that move I have never looked back. I give free advise over the telephone. You will find me friendly, helpfully and very knowledgeable. So why not give me a call on 07802 758166. If I have my hands full, or I have my head under a bath, please leave a message and I will return your call. I am a registered plumber with the Gas Safe Register. I do the work, I do not sub-contact it out.